A Royal Enfield Clubman takes its place in a living room it never leaves. The email began: "For five years I live in Warsaw, Poland, with a still brand new, never broken-in, Royal Enfield EFI Clubman in my living room." Wojtek Turyk was not complaining, just explaining how this could happen. Cafe racer conversion was done by Watsonian Squire in the UK. "The original Bullet Electra had... the seat replaced. Front fender and the gas tank are handmade from aluminum. The pegs were moved back to accommodate the more rear seating position. 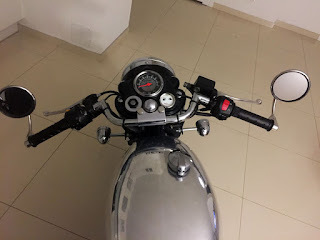 The classic ace handle bars with bar-end mirrors also are a replacement of the standard ones. The indicators are more proper. 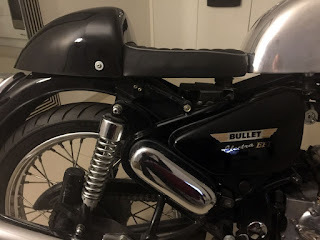 And, finally, the muffler is a handmade replica of the famed BSA Gold Star one. Supposedly it sounds as good, but I have not hear it yet! Clubman keeps the nacelle but adds ace bars and bar end mirrors. 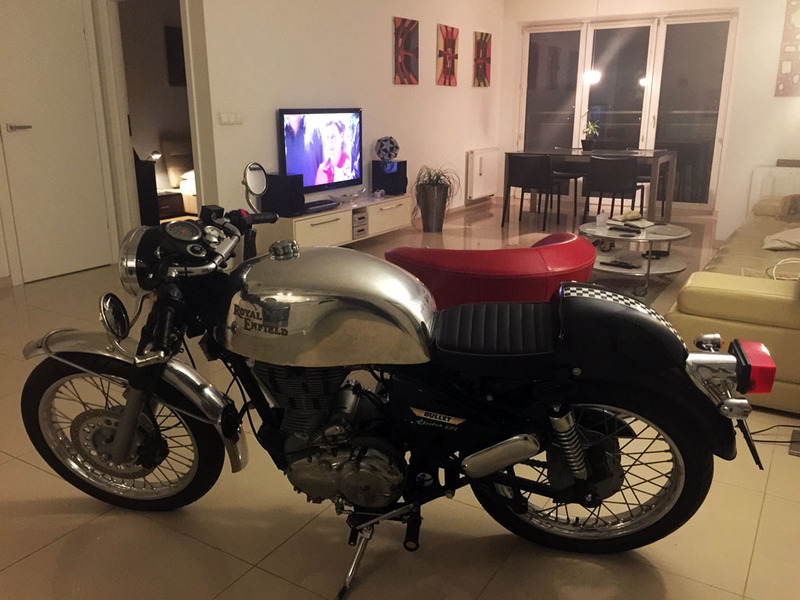 "The motorcycle was delivered in the wintertime, so instead of just sticking it in the garage, I thought I will put it into my apartment until the spring. Five years have gone and I am still more excited to have it with me here than riding it. 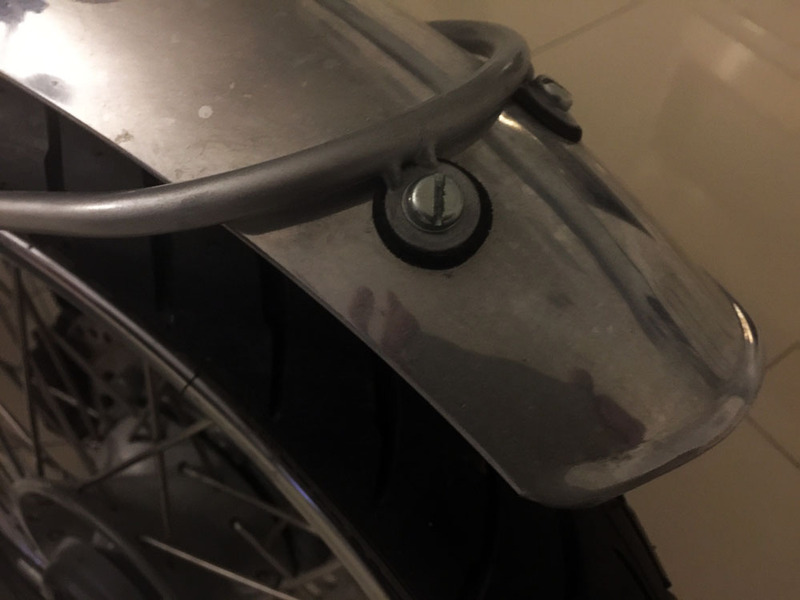 "In effect, for the first time since over 30 years I have stopped riding motorcycles. Yet, each spring I think I must take it out this time. However, at this point I am reluctant to ever start using it." Wojtek explained in a subsequent email that his first "real motorcycle" was a 1957 BSA, a 500cc A7 twin. Fender looks like it's on there to stay. "The BSA was the best motorcycle I had owned before I bought the Royal Enfield," he wrote. 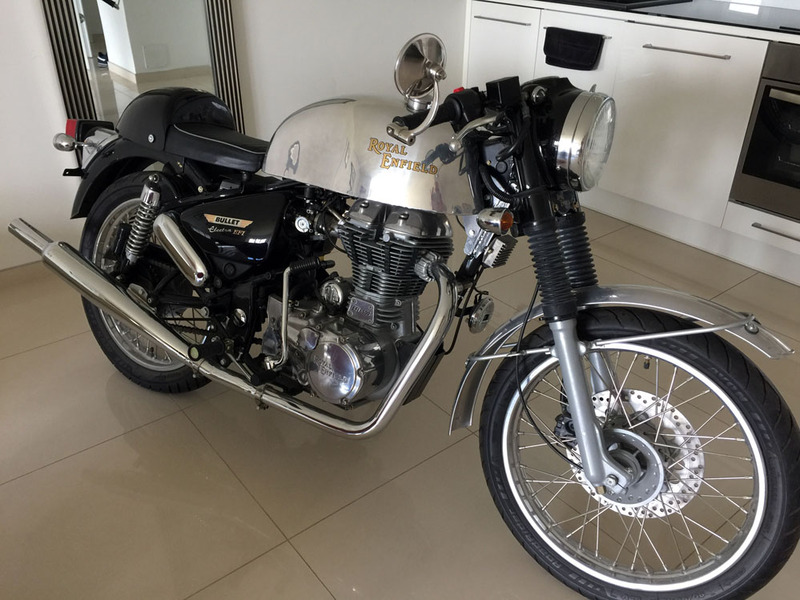 Later, nostalgia for a classic British motorcycle led him to get the reborn Triumph Bonneville, but this modern motorcycle turned out to be a "make believe classic. Besides the looks there was nothing classic about it, the engine modern, with a short stroke, and no thump to speak of." He realized he wanted to go back to a motorcycle like the BSA. He spotted the Royal Enfield Clubman on the Internet and ordered it sight unseen. 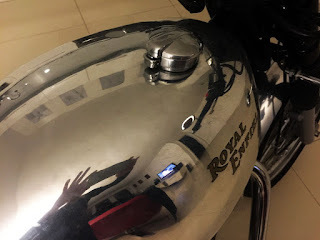 Shiny tank is the core of the Clubman look. "Buying it was a pure pleasure. Steve from Midlands Royal Enfield made it so. We still write sometimes and exchange the mutual passion for the brand. In fact, if I bring it out of my apartment and start it up this summer, I will like to take the machine back to where it came from, and visit Steve in England. "I was born in 1965, so not that old. Stopped riding because I was happy with the bike with me in the apartment and with the motorcycling all inside me, I think." Who wouldn't be proud of this look? It's a beautiful motorcycle and it would be fun to show if off. But Wojtek's story does not make me sad. He's obviously proud of his purchase and gets the pleasure he wants out of it. My own Royal Enfield Bullet doesn't get the exercise it used to when I was a commuter. I miss putting on miles but I enjoy just knowing it's waiting there (in the garage!) whenever I want it. I am very glad to share this story with you. I am very thankful to David for his interest in it and for making the story so fantastic and meaningful for that is what it really is to me.